Of course there's garlic in here are you kidding me? Who can eat pasta that's claim to be Italian without garlic somewhere in the recipe? Wonderful cheesy mac and cheese with buttered Italian bread crumbs ..... ( on just a side note, I make this rarely due to the high calorie content) but this mac and cheese is sinfully loaded with flavor and when you want to be bad with calories this is the one! Another side dish at my family reunion, when all else fails with picky kids, they'll love this one! In a glass microwave proof bowl add both milk, cheddar cheese soup and all the cheeses, microwave until cheese is melted and well blended with milk. In the meantime boil the macaroni in salted water al dente. Drain. Place in a large baking dish that has been butter generously. 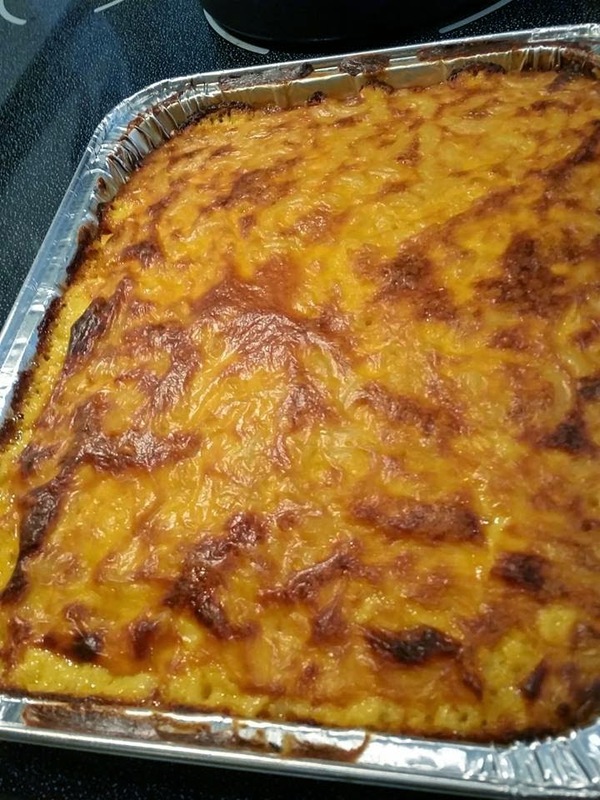 Place cooked macaroni in the dish. Add all herbs, minced garlic and spices to the milk mixture ,stirring together. Add to macaroni dish. In a separate bowl add bread crumbs and melted butter and mix. Sprinkle on the top of the macaroni and cheese mixture. Bake at 375 until browned and bubbly. Sprinkle with more grating cheese and prosciutto on top. you just made me so hungry! that recipe looks so delicious and incredible! You had me at garlicky and 5 cheeses :o) Looks delicious! oh,claudia,so yummy your dish,i'm drolling here! :))the photos are so sugestive! Love this "grown up" version of mac and cheese! Looks super tasty... yum! I love garlic and use a lot in my cooking. Garlic is good for health. Your pasta dish will surely go down well in my family. Mmmm, Looks like the perfect dinner! You've hooked me with 5 cheeses!! Have a great weekend! Family and pasta, always go together! of course cheese and pasta too and you made the perfect combination of taste, texture and fun! 5 cheeses. Pasta. Garlic. This is my dish! This looks delicious Claudia...I'm saving this recipe for when I can have my carbs again! Omg, I have to save up my calories and have this!! I love cheese + garlic, it's heaven!! This is totally delectable! Loving all the different cheeses and the prosciutto! Definitely a crowd-pleaser. Still following you. You are a dedicated cook! Oh! So rich and creamy with five cheeses and garlic. Divine! Looks so delicious!!! Holy crap, Claudia. This has to be the most amazing thing since string cheese. I am descended from a long line of mice - so the more cheese the better. Love all the garlic - heck - it' good for you! And you are right, the pickiest eater in the world would wolf this down. Well done! mmm. five cheeses-this is my knd of pasta! Love it!! yum, i love mac and cheese recipes! delicious!